Some budget travellers avoid Europe because they don’t believe there are any cheap European countries to visit, but that’s simply not true. 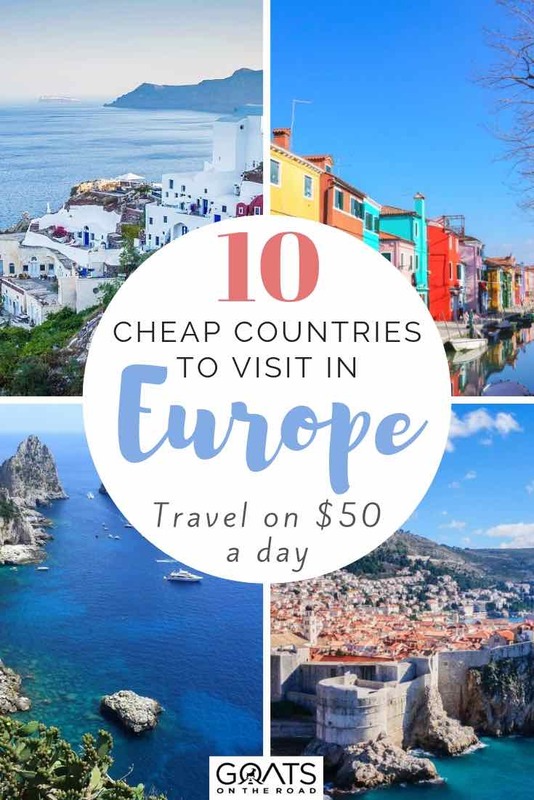 While the continent is home to some budget-busting destinations like France, Ireland and Norway, there are also some culture-filled, cheap European countries that can be visited on $50 / day or less. Even in the western part of Europe. In this article I’m going to break down our favourite cheap European countries of 2019 and show you how you can travel on as little as $50 / day in some of the continent’s most fascinating places. If you’re looking to visit more than just Europe, check out our list of the cheapest countries to visit in 2019 and if you’re an expat or digital nomad like us, check out our list of the cheapest places to live. 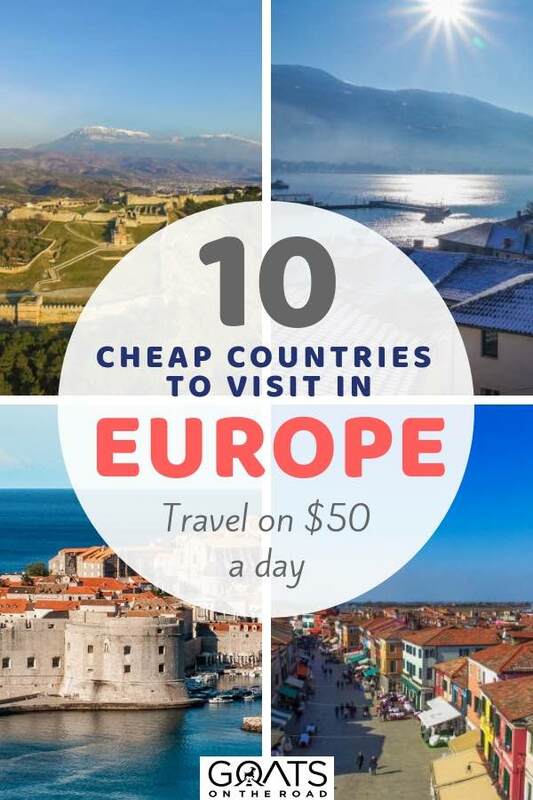 Before I get into the cheap places to visit in Europe in 2018, I should point out that it’s not always easy to travel on $50 / day or less, particularly in the last couple of countries on this list. But if you take into consideration a few money-saving tricks, you can easily save a lot of money off your daily budget, and bring it down to around $50 / day. In almost all cases, you’ll find cheaper accommodation in Europe on Airbnb, particularly if you book well in advance. Even in more expensive cities, it’s possible to find apartments for $15 – $20 / night if you book early enough. You can save even more by staying in a private room in an apartment, rather than having the entire place to yourself. Because some apartments are so cheap, you can use our special $25 Airbnb coupon code and actually pay for up to two nights for free… on us! Want to find free accommodation in Europe? 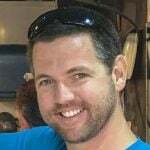 Consider finding house sitting jobs or couchsurfing. By renting your own apartment instead of staying a hotel room, you’ll also get your own kitchen. This means that you can cook for yourself and save on meals. When we travel in Europe, we often cook 1 or 2 meals per day in our apartment, but we still make sure to go out and try the local cuisine at least once per day. Another option is to look for food festivals that often have free samples available, or in the case of Italy, aperitivo which includes free food when you purchase a drink. Europe is great for free walking tours in many of the major cities. To find these, simply run a Google search: “Free Walking Tours in [city]” and you’ll find one to reserve. I’ve also listed a lot of other free activities for each of the cheap European countries listed in this post. For some activities like island cruises and multi-day treks, you can save money by booking last-minute. If there’s already a group formed or a sail scheduled, talk to the tour operators about last-minute discounts. In almost all cases, you’ll save money by booking trains, ferries, buses and flights in advance. If you’re travelling to multiple cheap countries in Europe, you may want to look into a Eurail pass. If you plan to fly a lot, try to fly carry-on in order to save money on baggage. Here are 10 cheap European countries to visit in 2019. 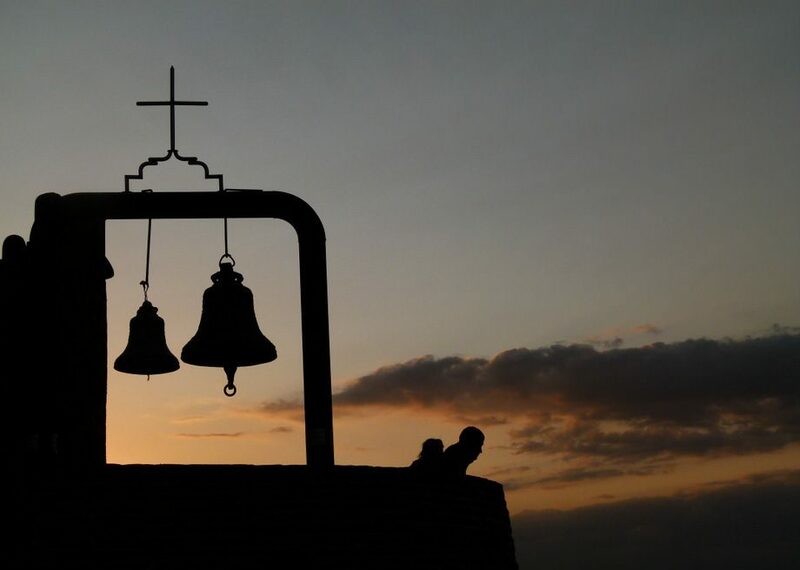 Free activities: Hiking, chilling on the beach, wine tastings, visit Monastiraki Flea Market, hike Lycabettus Hill, Museum of Popular Instruments and many more. Ahh Greece. The word itself conjures up images of dazzling pebbled beaches, tantalizing sunsets and clusters of white buildings cascading into the Mediterranean Sea. While most people have fantasized about a holiday in Greece, very few realize that it’s truly one the best cheap European countries to visit. It’s quite easy to spend $50 / day or less, particularly in the off-season or the shoulder season, when the price of flights and accommodation can be discounted by as much as 50%. We have visited Greece on multiple occasions and every time we are amazed by the value of this island blessed European nation, and the hospitality of the locals. There are endless things to do in Greece, you’ll never be bored. 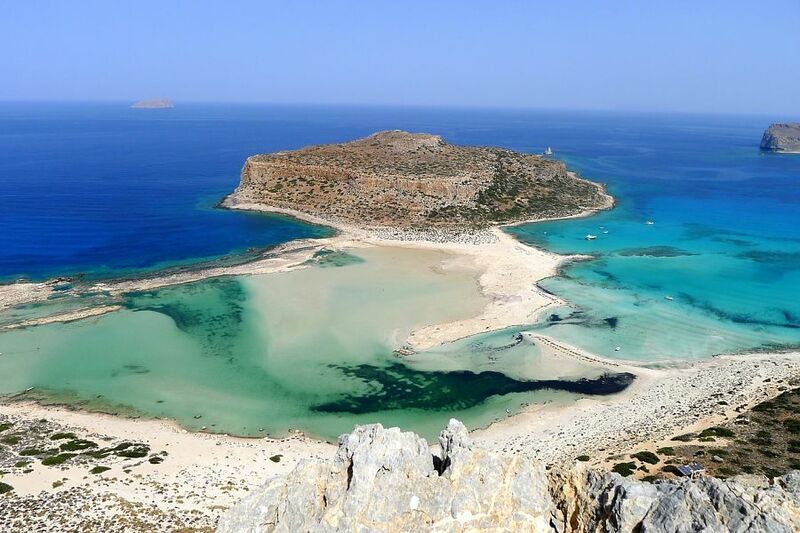 We’ve stayed in beautiful, modern studio apartments for less than $20 per night and dined on fantastic authentic Greek cuisine for $7 – $12 at a nice restaurant with a view. 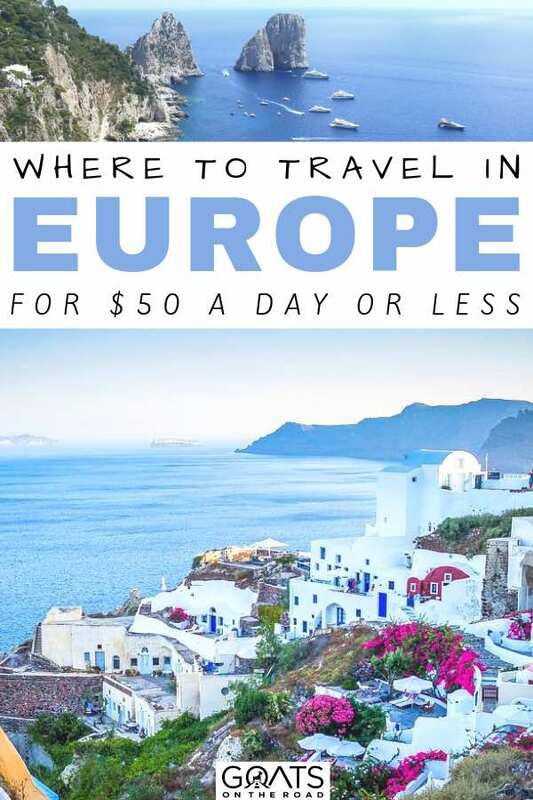 If you’re looking for a stunning destination in Europe that won’t break the bank, I think Greece rightfully tops this list. Despite its close proximity to the UK and its popularity as a vacation spot for many of Western Europe’s most affluent nations, Spain still remains one of the best cheap countries in Europe and offers incredible value for money. 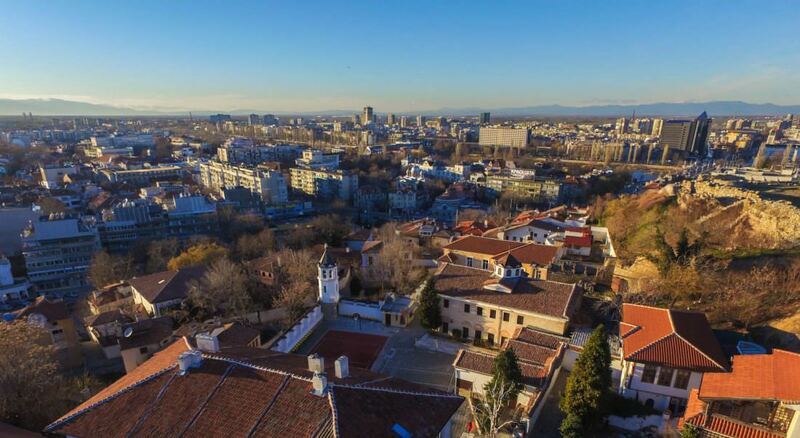 Not only is Spain affordable, it’s one of the most geographically diverse countries on the continent, with snow-capped peaks and breathtaking Mediterranean beaches. While your money won’t go as far in the larger cities like Madrid and Barcelona, it is still possible to live on very little in Spain, particularly if you stay in a nice Airbnb and cook a few meals for yourself every day. Make your way outside of the overly popular cities (Barcelona in particular) and enjoy all of the other villages, towns and cities in Spain – not only will your wallet thank you, but your experience may be richer since the residents of Barcelona becoming quite jaded due to over tourism. Food in the grocery stores is an incredible value and you can purchase decent bottles of wine for around 2 euros. There are countless pueblos blancos (White Villages) around the country where you can park your car or take a bus to the entrance and stroll around in a vehicle free, time warp environment. Tapas in Spain, particularly in smaller villages, are of great value and you can usually fill up on under $7 including a glass of wine (if you’re not near the beach). One of the best values in Spain is the great network of cheap domestic and international flights (to other countries in Europe). Bulgaria was one of our biggest surprises on all of our travels to the continent. Without a doubt this is one of the cheapest European countries, if not the best value overall. We couldn’t believe how affordable and lovely Bulgaria was. We stayed in gorgeous hostels that were inside centuries-old buildings. 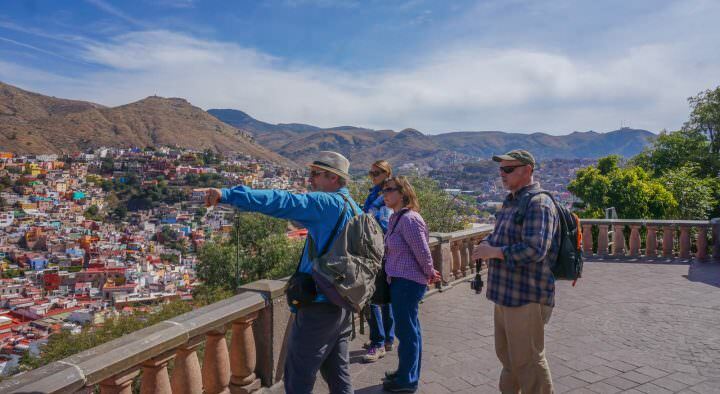 We enjoyed free walking tours and the meals were of incredible value. The Bulgarian people are some of the friendliest in Europe and the nation is blessed with fascinating old towns, ornate churches, delicious cuisine and world-class wine. There are also numerous festivals to be enjoyed, particularly during the summer months, and some very pristine nature. But the value for money is really hard to beat. I’ll never forget one evening we were out with our friend and the three of us ate and drank wine from 5pm to midnight and when the bill came at the end of the night it was so low that we told the waiter that there must have been a mistake. There was no mistake. We had eaten, drank and danced with the staff for about 7 hours and spent around $35 total. As a bonus, in Bulgaria travellers always receive some of the best service you could ask for. Finding This Post Useful For Your Next Europe Trip? Please share! While we haven’t yet been to Poland, we’ve done ample research and definitely plan to visit it during our next trip to Europe. The truth is, I’d be doing you, the reader, a disservice, by leaving this fantastic budget destination off the list, because Poland is definitely one of the cheapest countries in Europe. But the unbelievable value for money isn’t the only reason Poland is high on our bucket list of travel destinations. With postcard perfect cities like Kraków and Gdańsk, a rich history, pristine nature, a hearty and delicious cuisine and some of the most notoriously friendly people in the region, Poland has been calling us for many years. If you look at Airbnb, you’ll see that Poland has some of the best value apartments anywhere in the world. Even in the capital of Warsaw, there are almost too-good-to-be-true modern apartments in the city center for $15 / night! There are also countless hostels and budget hotels with nice rooms for around $20 and meals at local restaurants come in at around $5 and there are some street options for much less. Kraków has recently become a bit of a digital nomad hot spot thanks to its affordability, unique vibe and decent wi-fi. I could definitely see us posting up here for a couple of months on our next trip to Europe, with perhaps some trips to other cities in the country. 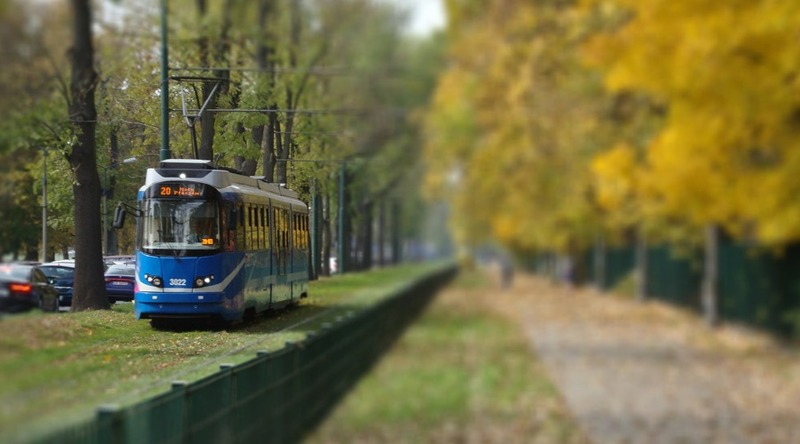 Don’t miss Poland, it is definitely one of the cheapest European countries. Albania is a rugged, off-track destination in Europe. Surprisingly, while it’s definitely the least-visited of the destinations on this list, it’s not actually the cheapest country in Europe. There are some better values to be had on this list, but none offer the adventure and intrepid feel that Albania does. If you want to visit one of the cheapest European countries while not seeing another traveller for days on end, then Albania is your place. With beautiful beaches, dramatic mountain landscapes and forgotten villages, Albania is a place that feels lost in time. 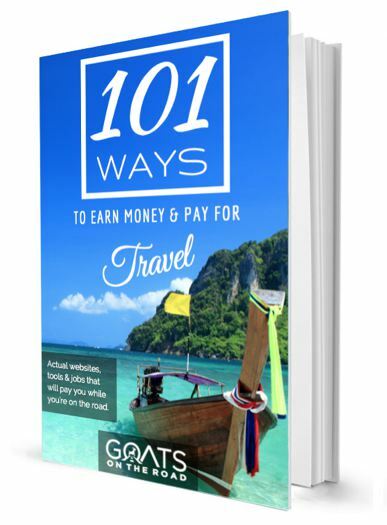 This is one destination in Europe where you’ll definitely find goats on the road! Still one of the most underrated places to visit on the continent and without a doubt one of the best cheap European countries to visit, Georgia surprised us at every turn. From the easy entry visa to the wonderful wine and the modern-meets-ancient city of Tiblisi, this is one place that is all to often overlooked by travellers – which is surprising as it’s one of the best visa free countries for travellers. With entire apartments on Airbnb starting at a staggering $10 / night, and delicious, hearty meals at nice restaurants starting at around $6, Georgia over delivers for the price on pretty much every aspect of travel. Plus they give most nationalities a 1 year visa on arrival, making it the perfect place for expats and digital nomads. Outside of the city of Tbilisi, you’ll find stunning mountains, small villages and cheaper prices. Coming from Turkey, we expected Georgia to be a lot more expensive, but we were blown away by how affordable it was and how much we loved the capital city. We’ve considered living in Tbilisi many times since our first visit in 2011, but we just haven’t made it back. One day we’ll definitely return to explore more of this fascinating and cheap country in Europe. 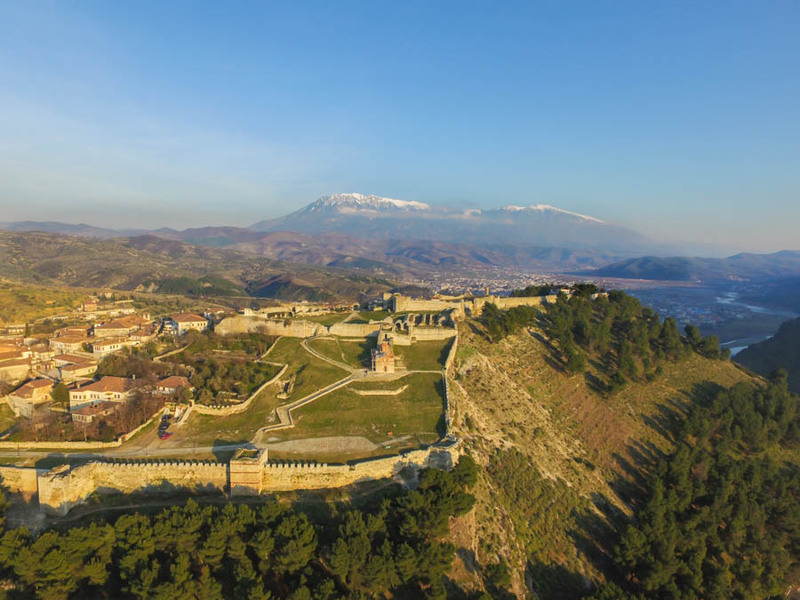 While the Republic of Northern Macedonia is one of the cheapest European countries, it’s also one of the least visited. We spent a few weeks driving around the country and while I do recommend a rental car, it would likely bring your budget up over $50 / day because it costs around $25 / day for a car. But if you choose to take local transport around Macedonia (or walk, or hire a bicycle), you could definitely do it on well under $50 / day. Budget hostels and apartments here are of wonderful value and if you come during the winter, you can hit the slopes for less than pretty much anywhere else in Europe. Meals here will rarely cost you more than $5 (although I did once have a perfectly cooked rib eye steak for $10) and there are plenty of free activities to be had. 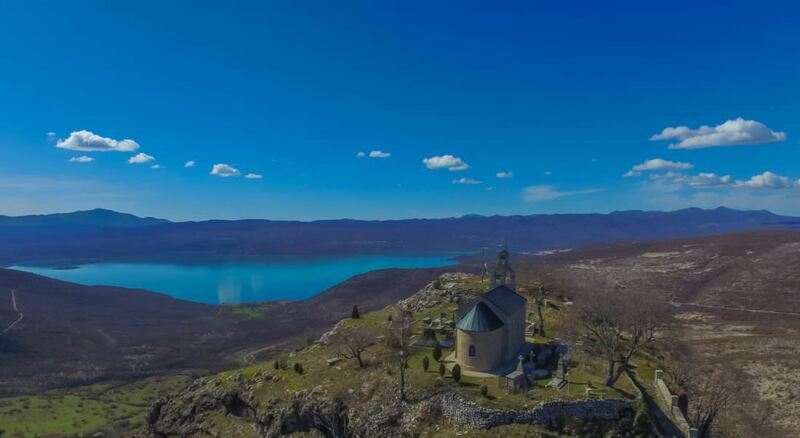 Lake Ohrid offers countless hikes into the mountains and up onto stunning viewpoints over the lake. This region still remains as one of the most visually stunning places we’ve ever seen, and we both travelled here for under $50 / day if you don’t include the cost of the car rental. The bay of Kotor remains as one of the most dramatic and visually stunning places we’ve ever seen in our travels, while Montenegro as a whole still offers relatively good value for money. This isn’t the cheapest European country, but we’re getting down the end of the list I would be crazy not to include Montenegro as one of the best places to visit in Europe on a budget! 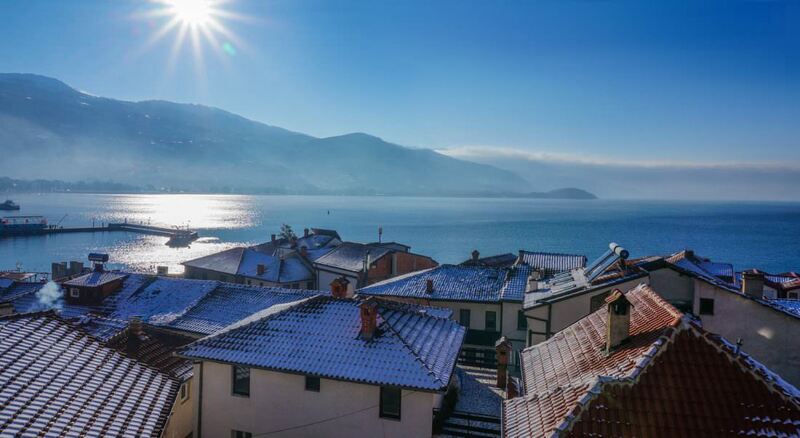 If you want to do Montenegro cheaply, you’ll have to come here in the shoulder or off-season. 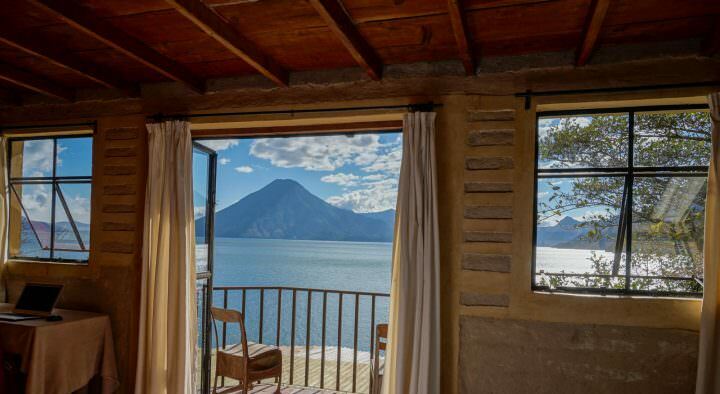 But if you do, you’ll be rewarded with not only breathtaking views of this topographically blessed nation, but also great discounts on accommodation and tours. We visited Montenegro in early spring and we while we weren’t watching our budget, we lived on around $65 / day. For one person, it would be quite easy to get by on $50 / day during off-peak periods. 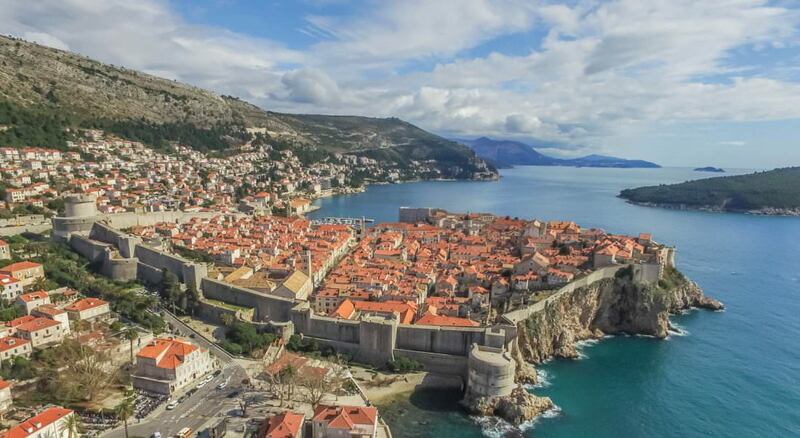 From the spectacular Game of Thrones movie set village of Dubrovnik, to the laid back islands of Hvar and Korkula, Croatia dazzles visitors with a mix of well-restored historical cities, raw nature and beautiful beaches. We lived in Split, Croatia for a few weeks in 2016 and loved it. We had a nice apartment near the old town for around $35 / night and we found some wonderful local restaurants where meals started at around $8. 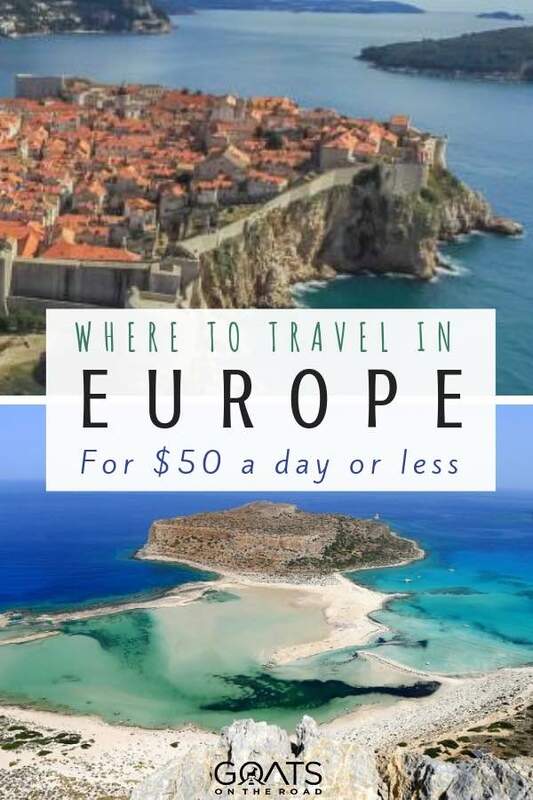 It would definitely be a stretch to say that you’d be able to do Croatia on $50 / day in the high-season, but during the shoulder and off seasons, heavy discounts make Croatia one of the cheapest European countries to travel to. Plus, if you venture away from the well-known towns, you’ll have the place to yourself, while enjoying more affordable travel. 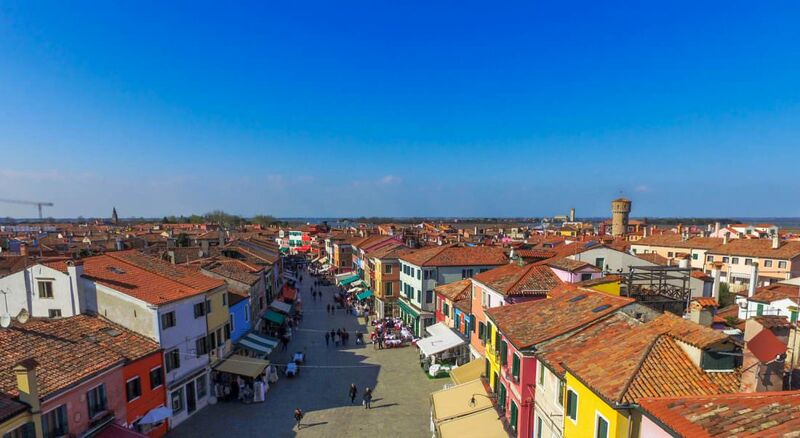 Free Activities: Free wine tastings, watch pizza being made, watch street performers, get lost in Venice, free walking tours, free food samples! I know what you’re thinking. Italy is not one of the cheapest countries in Europe. 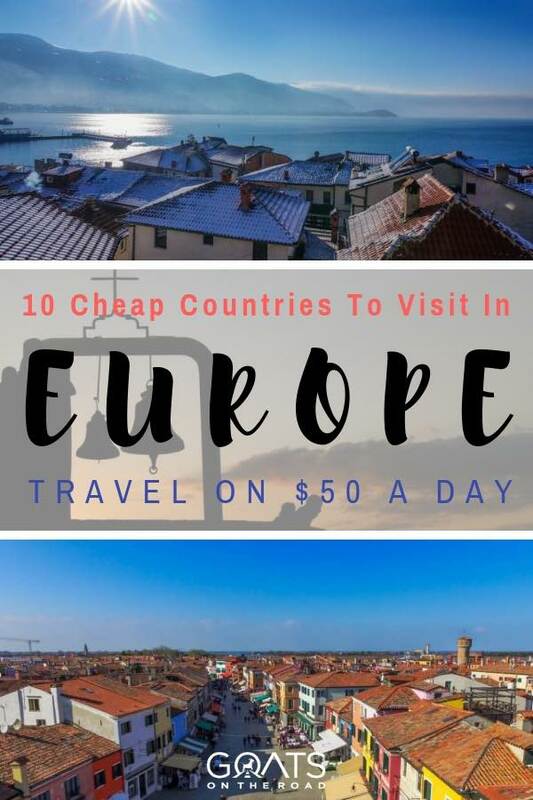 While this may be true, I wanted to make sure I included all of our favourite countries in Europe that can be visited on $50 / day or less. Believe it or not, this is possible in Italy as long as you visit in the shoulder season and stay in cheap apartments. Even in Rome there are private rooms on Airbnb for just $15 / night if you book well in advance. You’ll have to cook for yourself at least twice per day and only take the cheapest modes of transport in order to keep your budget low, but with free walking tours, free wine tastings, lots of affordable food and great hiking, Italy is a wonderful destination and can be visited on a budget. Walking rather than taking a taxi. Look for free food during “aperitivo” hours. Join free tours. Consider couchsurfing, house sitting or a private room in an Airbnb. Travel during the off / shoulder season. Spend time in the countryside, rather than the cities. Travel slowly – explore a region, rather than trying to see it all. Bring a picnic with wine to the piazza / park / beach rather than purchasing expensive food and drinks. Contrary to belief, travelling Italy on the cheap is definitely possible. 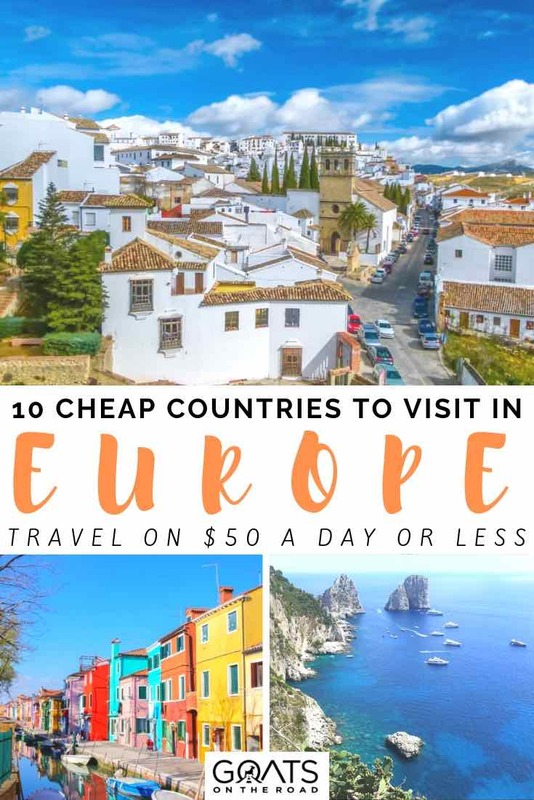 While this list may not include all of the cheapest European countries according to cost of living and cost of travel indexes, I believe that these are the 10 best cheap European countries to visit in 2019, that offer incredible experiences and value for money. We love every one of these countries and have been to them all aside from Poland, which is high on our list of countries to see. If you want to visit Europe on a budget, consider staying in apartments, cooking for yourself and seeking out free activities. We missed some! What are your favourite cheap countries in Europe and why? Share in the comments below. I was excited about Georgia and then I read the air pollution is really bad. Ditto for Poland. Thoughts on this from people who have traveled there? Yes!! Agreed The mountain air is amazing. Thanks for the article. However I would never encourage anyone to use airbnb, which seems to be one of then big points of the article, specially when travelling to big cities. The city of Barcelona, mentioned in the article, is a good example of how airbnb is making the housing go up and up, making them unaffordable for local people. At the moment, entire buildings are being sold to create tourist apartments, with people who have been there their entire lives, including the elderly, being evicted. Therefore I would only use airbnb if I would be sharing the flat with bthe person who actually lives there. Another thing I would like to point out is that I would discourage taking internal flights in a small country as Spain, where the train and bus network is very good and doesn’t pollute as much as flying. These are two things that I would definitely consider if I’d like to do sustainable tourism. Thanks for the great article. I love reading all of your posts. Don’t forget Spain’s neighbor, Portugal. I was just in Spain and Portugal this past May and June. I spent 10 euros less per day in Portugal than in Spain, with no difference in traveling style. There’s lots to see, the people are awesome, and the food is some of the best I’ve ever tasted. I think I may live there for a bit next year. Thanks again for all the great info and stories. Yes, completely agree – not sure how Croatia and Italy get on their ahead of Portugal – it’s way cheaper than either, and really good value. I’m also looking at spending a fair bit of time there this summer. Great list! We’ve been fortunate to visit most of these countries and completely agree with your advice. You can get phenomenal value in all these places during the shoulder and offseason. I have dual Greek citizenship and have visited many times over the years. 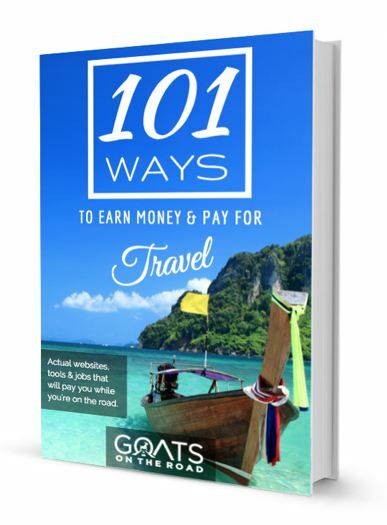 I’m thrilled it tops your list – it’s a wonderful country and a great value off season!